The Squirrel Ears come on a headband and are available in One Size Fits Most. These adorable ears are perfect as a costume building block for many different squirrel, chipmunk, raccoon, or fox costumes. 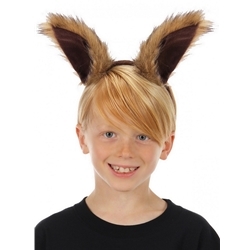 Whether you’re looking to become a classic squirrel, or dressing up as a Pop Culture character, the Squirrel Ears have you covered. It’s no secret that squirrels are among the most well known woodland creatures, found in almost all but the most frigid or sandy regions. Rocket these ears into your shopping cart and represent the squirrel population near you today!